When it comes to selecting a formula for your baby, there’s no doubt that Similac is one of the leading brands. It’s tried and tested by parents and has become an extremely trustworthy brand for your baby’s health and wellbeing. It ticks the correct nutrition boxes and takes care of the hard work when ensuring your little one is well fed. However…While this is all very beneficial and attractive to most parents, Similac isn’t for everyone. There’s not one formula that fits every baby’s needs and requirements, so it’s important to get an understanding of what other alternatives to Similac are out there on the market. For example, as Similac has earned its reputation for being so reliable and popular, it’s fairly expensive. All parents are in a different financial position from one another, so choosing a cost-effective formula could be vital. There’s also the fact that some babies simply will not take to Similac. This is something that can’t be accounted for – babies can be fussy or allergic to certain foods whether we like it or not! 1.1 Can your baby drink cow’s milk? 1.3 Where you can buy your baby formula – what if it runs out? 2.1 Is formula safe for babies? 2.2 How much formula does my baby need? 2.3 Is it safe to alternate breast milk and formula? Can your baby drink cow’s milk? The simple fact is not all babies react well to cow’s milk and can develop allergies from a really young age. If yours is one of them, you’ll need to find a baby formula that contains soy milk, which is a great alternative to dairy. There are plenty on the market, so you shouldn’t be stuck for choice. When choosing a formula for your baby, there should be a good balance of proteins, fats, carbohydrates and micro nutrients. Lactose gives formula a great consistency that closely resembles breast milk. You’ll also find vegetable oils in formula, which replaces regular fats found in milk and is easier for your baby to digest. All ingredients have been carefully added to formula so that it’s easily digestible for babies, so make sure you always avoid regular milk and stick to formula. Where you can buy your baby formula – what if it runs out? This is something that is often overlooked, but when your baby’s formula runs out (especially unexpectedly), is your tried-and-tested formula easy to buy in your local drug store? If the answer’s no and you rely on your online orders, then obtaining your baby’s formula will take a little more forward planning. Bulk buying is a good idea and make sure you order more before your stocks run out. Price and affordability is always a big consideration, but as baby formula is so important for your baby’s health and growth, we don’t recommend making it the main deciding point when choosing the right one for your child. The main thing to keep in mind is why you’ve chosen your particular formula instead of Similac. It could factor in any of the points we’ve mentioned above, from whether your child can have cow’s milk to whether you need to be able to buy it in-store. To gauge an idea on price, Similac Advance weighs in at $61.91 per 32 oz bottle on Amazon ($1.93 per oz), so use that as your guide on price. Is formula safe for babies? Baby formula is nutritious and contains everything your baby needs to grow and develop. It’s typically less digestible than baby milk, so babies who are fed on formula need less milk than breastfed babies. This is something to bear in mind. 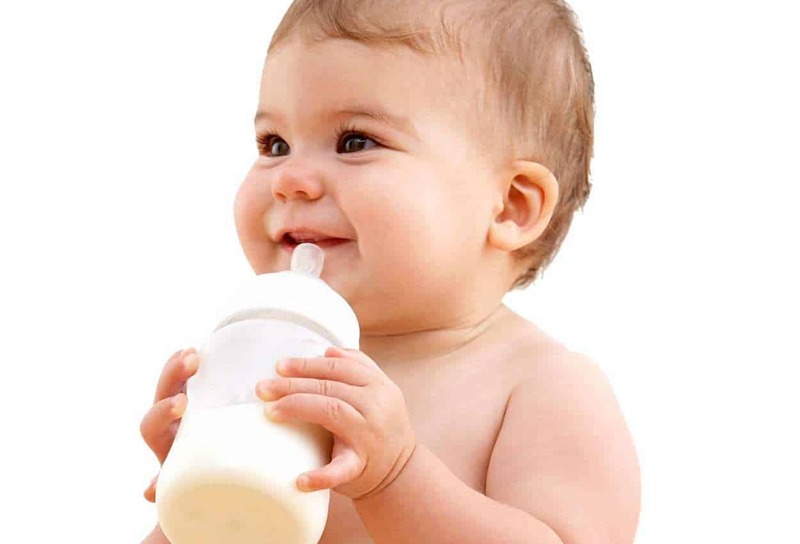 As a general rule of thumb, babies need around 2 ½ ounces of formula each day for every pound of body weight. At first, your baby will need a bottle every 2-3 hours. As they grow, that will increase to around 3-4 hours. Is it safe to alternate breast milk and formula? It’s definitely fine to alternate between the two if you need to. This is known as ‘supplementing’ and it is particularly useful if you have a low breast milk supply. It’s really down to your own personal choice whether you wish to do this or not – everyone is different, but just double check with a doctor first before committing to this. Below you’ll find the top five baby formulas that we think make a great alternative to Similac. We’ve done our best to include a variation of price, ingredients and nutrition so there should be something for everyone. After listing and reviewing each product, you’ll find a list of pros and cons to summarize the main points discussed in the product review. This should help you make the right choice when it comes to making that all-important decision on which baby formula is best to you. We’re going to kick things off with Enfamil Enspire Infant Formula a formula priced very similarly to Similac at $1.95 per oz (on Amazon). Enspire is one of the most popular choices when it come to their range of baby formulas. This is because they use no genetically modified ingredients and the only sweetener they use is lactose, which is a much healthier option. Enspire contains a number of essential ingredients for your child’s growth, including MFGM and Lactoferrin – both of which are found in breast milk. This gives this formula a very natural feel and taste, providing a fantastic alternative to breast feeding. This may be a fairly pricey formula, but it features top quality ingredients and plenty of nourishment, so you can be rest assured it’s a great option for your child. Overall, Enfamil Enspire is a great and reliable formula which will tickle your baby’s taste buds all the way through their first year. Gerber Good Start Gentle is an absolute winner when it comes to finding a reliable baby formula on a tight budget. This formula is very reasonably priced at just $1.12 per oz on Amazon, making it a much more affordable option than a lot of other brands out there. Again, you’ll find no genetically modified ingredients in this – only a wide range of nutrients and vitamins that are perfect for your baby’s health. This gentle formula is kind to babies while they digest due to its ingredient blend, and the sweeteners are made up of 70 percent lactose and 30 percent corn maltodextrin – all natural. The brand themselves say that this formula is “modeled after the complete nutrition and gentleness of breast milk”, meaning there is a strive for their formula to be as close as possible to breast milk. This offers reassurance that this formula will be as gentle as possible to your baby. Organic Dairy from Earth’s Best is a formula which carries a strong claim – they use all-organic ingredients with absolutely no genetic modification. This is definitely an appealing selling point. This formula uses Omega-3 DHA and Omega-6 ARA in its ingredients, which are both said to aid in the development of your child’s eyes and brain. These two acids are found in breast milk, too. Earth’s Best baby formula also comes in a variety of different options to try – Organic Dairy, Organic Dairy NonDHA and Organic Dairy Gentle. This gives a wide range of choice and will allow you to tailor your baby’s formula depending on their preferences or requirements. When you consider the price, you really do get a lot for your money; all-organic ingredients with extra iron, extra Omega acids and a gentle blend to help your child’s digestion. This is the second cheapest formula we have reviewed, at only one dollar per ounce. Baby’s Only Organic Whey Protein Toddler Formula is a unique formula using purely organic ingredients, including whey protein to help with the growth and development of your little one. This blend is completely free from corn and gluten (which is great if your baby can’t tolerate these), and uses absolutely no genetic modification in any of their ingredients. This makes Baby’s Only a strong choice for your child’s health. This is also the only formula we’ve compared that uses extra protein to enhance the nutrition, which is a key part of a growing child’s diet. This might work very well for your baby. However, we should mention that this formula does contain synthetic ingredients such as nucleotides, which aren’t so desirable. Overall, the price is also reasonable at $1.57 per ounce. This formula is a no-nonsense blend. It’s cheap, gluten free and non-GMO. The ingredients are geared towards replicating breast milk and to be honest, they do a good enough job of it. This blend also contains extra iron and DMA, another acid which aids the development of the eyes and brain. You can’t argue with the price. At 82 cents per ounce it’s a very affordable option and won’t break the bank as much as Similac or Enfamil formulas. This formula really does keep up with some of the bigger, more expensive brands and is perfect for parenting on a budget. We understand that finding the right baby formula can be quite intimidating for new parents, but with the right amount of guidance as well as some trial and error with your child, you’ll soon be discovering which one works best for you. Whilst we can’t strictly tell you which formula will work best for you and your baby, we hope our guide has provided you with enough guidance to make a start. Earth’s Best Organic Dairy Infant Powder has to be our top choice overall; you get so much for your money! It’s great that they use completely organic ingredients in their formula – you literally can’t go wrong with going organic. And no genetic modifications help to give that extra peace of mind that it’s a good choice for your baby. Enfamil Enspire is a close second. It’s a great quality brand that’s tried and tested with parents all over the world, and contains many ingredients found in breast milk. If you’re switching over, this formula will make the transition fairly painless. The golden rule to remember is all children are different, so don’t be disheartened if they aren’t too pleased with your first choice in formula. For the in-depth scientific stuff it’s best to contact a nutritionist or pediatrician for some expert advice in this field. It’s also important to assess your child and make a decision on whether to stick to your current formula or switch to something new. You will likely be able to tell whether they’re taking to the formula or not, but if not don’t be afraid to switch to something else. There are so many different baby formulas out there and as our guide shows, they all have something unique to offer. If you need any further support or have any questions for us, please don’t hesitate to get in touch. Your feedback is important and we love to know we’ve made a difference or made life a little easier for you.